JUST LAUNCHED! LIMITED TIME PROMOTIONAL PRICING! Our large suture pad is the highest quality product on the market for medical students and professionals alike. 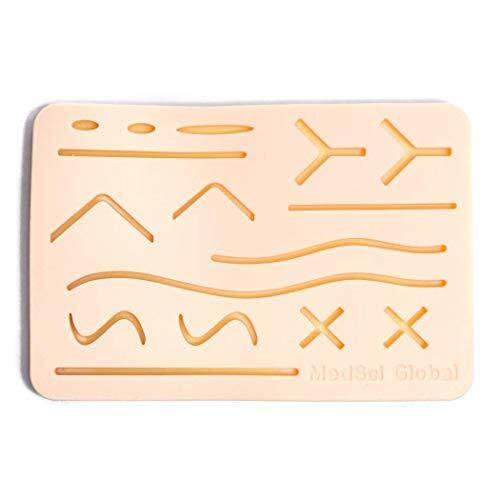 At 7.2" x 5.2", our silicone suture pad is LARGER THAN MOST COMPETITORS, but still mobile enough for you to take anywhere with ease. Additionally, our suture pad is FIRMLY SET ON A STURDY BASE to easily practice your suturing and knotting techniques. Our pad features 14 cuts of various width, depth, and patterns to give you a sense of the types of wounds that medical professionals suture every day. Additional incisions can be made with a scalpel and sutured the same as the pre-med cuts (NOTE: scalpel, sutures, and forceps are not included). There are three layers, representing skin, fat, and muscle. 100% Satisfaction Guarantee on ALL MedSci Global products! Your satisfaction is our #1 priority. Please do not hesitate to reach out to us if you have any questions or concerns. 100% SATISFACTION GUARANTEE on ALL MedSci Global products! View More In Science Education. If you have any questions about this product by MedSci Global, contact us by completing and submitting the form below. If you are looking for a specif part number, please include it with your message.